(Yamanaka, Chicago); sold to Harry G. Steele [1881-1942], Pasadena; his widow, Grace C. Steele [d. 1974]; gift 1972 to NGA. This bowl is thinly potted, and the foot-ring is rounded. The bases is recessed and glazed, surrounded by a ring of yellow glaze. 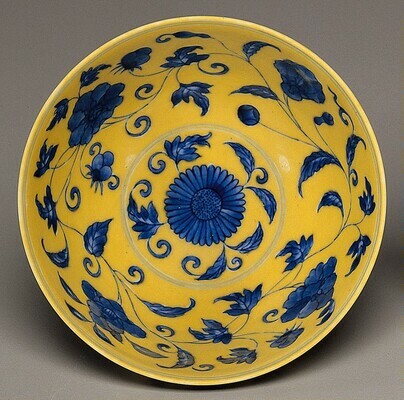 The blue underglaze design is executed with a thin, dark outline and a mottled blue wash.
Bower, Virginia, Josephine Hadley Knapp, Stephen Little, and Robert Wilson Torchia. Decorative Arts, Part II: Far Eastern Ceramics and Paintings; Persian and Indian Rugs and Carpets. The Collections of the National Gallery of Art Systematic Catalogue. Washington, D.C., 1998: 250, color repro.